Search Window was not created to help you search the web. The name of this advertising-supported program is misleading, and the only thing that it will help you search for is trouble. We have no doubt that this adware is unreliable simply because we have analyzed plenty of programs identical to it in the past. Constant Fun, Bronze Aid, Discovery App, and hundreds of other ad-supported programs were created using the Injekt engine, and they all work in the same manner. Although it is not clear whether or not all of these programs were created by the same company, we can assure you that all of them are just as unreliable. According to our research, this adware can easily expose you to unreliable content created by schemers, and this might lead to other problems. We are here to make sure that you do not encounter these problems, and the first thing you should do is remove Search Window. Thesearchwindow.com is the website that was set up to promote Search Window; however, it does not actually offer an installer. Again, this is something we have seen in the past as we analyzed the removal of other similar/identical threats. Unfortunately, this adware is most likely to be distributed via software bundles, and they could carry seriously dangerous malware! Trojans, ransomware, keyloggers, viruses, rogue malware removal tools, fake system optimizers, the Searchinterneat-a.akamaihd.net hijacker, and various other infections could be distributed along with adware without your notice. Of course, it all depends on the installer used for the distribution of this strange Injekt-based program. Needless to say, it is unlikely that this program will be dispersed by authentic, reliable installers. Due to this, it is imperative to scan your PC to check if you need to remove other infections as soon as you discover Search Window. This is not difficult to do if you employ a reliable malware scanner that was designed to find every single threat. Seque Source is the company whose signature can be found within the files associated with Search Window. These files can be found in several directories, including %Program Files% and %Temp%. You will find the files within these directories if adware takes over Internet Explorer and Firefox browsers. Two of the files – 7za.exe and Uninstaller.exe – are the same for all Injekt programs. The original files in this case are firefox@www.thesearchwindow.com.xpi, which represents the Firefox extension, and 310eeba3-f844-4bdb-8204-0f7738a73264.dll, which represents the IE extension. Obviously, you must remove these files, but you do not necessarily need to eliminate them from their original locations. In fact, if you remove the files, you will also need to delete quite a few registry keys, and that is something that inexperienced users should not mess around with. The good news is that there is an easier, error-free way to eliminate this adware from your operating system. 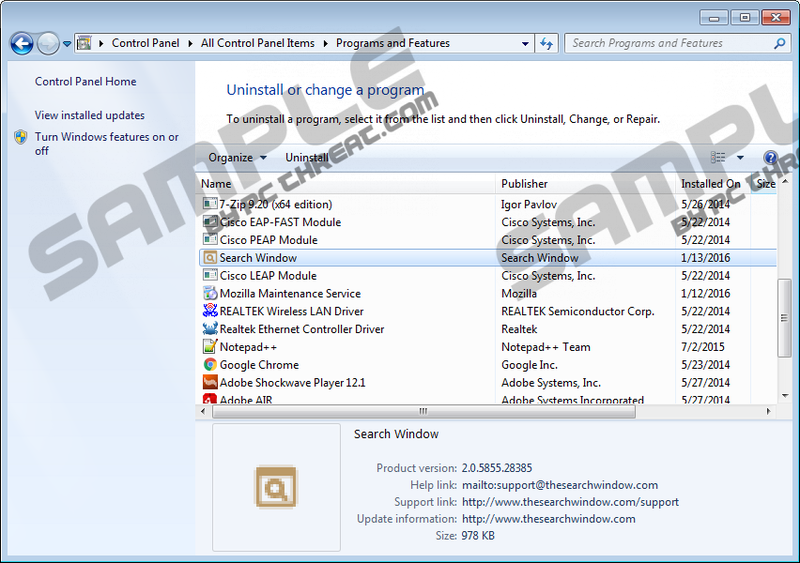 Uninstalling Search Window is effective, and you can use this method to eliminate this adware completely. As soon as you uninstall this adware from your PC, make sure you find and remove the remaining threats. Although this adware can leak private information, flood your screen with misleading offers, and help cyber criminals scam you, other threats could be even more aggressive and malicious. If you are having trouble identifying and removing this malware, a reliable anti-malware tool is exactly what you need. Many users are hesitant to invest in authentic tools because they believe they can get rid of malware manually. Unfortunately, most of them fail because malicious programs are designed to resist. Even when you think you have succeeded, a hidden file could perform malicious activity and even restore infections. Another thing to think about is the protection of your virtual security. If Search Window has successfully leaked information about you, you might be in trouble even if you have deleted this adware completely. We strongly recommend implementing a trusted security tool to guard your operating system. Also, you should change passwords and beware of scams that could be presented to you using information about you. Needless to say, if anti-malware software exists, you minimize the risks of being targeted by criminals. N.B. It was found that Search Window could change its name by adding other words to its name. Beware of this, and, if you notice this, make sure you remove clandestine adware. Click Control Panel and go to Add or Remove Programs. Remove the undesirable program from the list. Click Control Panel and navigate to Uninstall a program. Right-click the application you wish to eliminate and click Uninstall. Open the Charm bar in Metro UI. Click the Search icon and enter Uninstall a program to find this utility. Identify the unwanted program, right-click it, and choose Uninstall. Enter Uninstall a program into the Taskbar search. Find the application you want to eliminate from your computer. Right-click this program and select Uninstall. Quick & tested solution for Search Window removal.